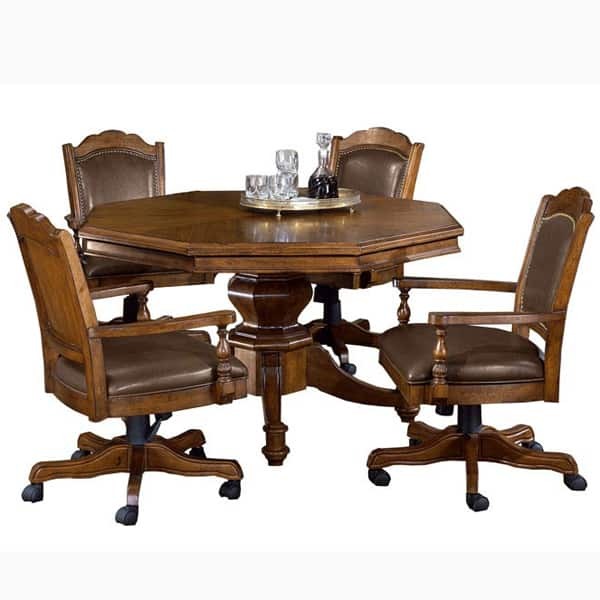 While the chairs offer an antique look similar to Eastlake dining chairs, the main lure of the Nassau Game Table Set from Hillsdale Furniture is the multiple functions found within the table of this game room set. 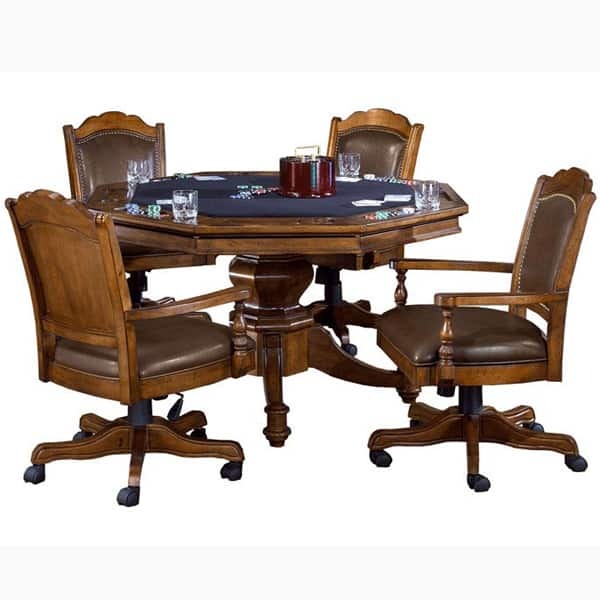 The table offers two interchangeable surfaces: a polished and smooth dining table along with a game top complete with a black felt surface, poker chip wells and cup holders. 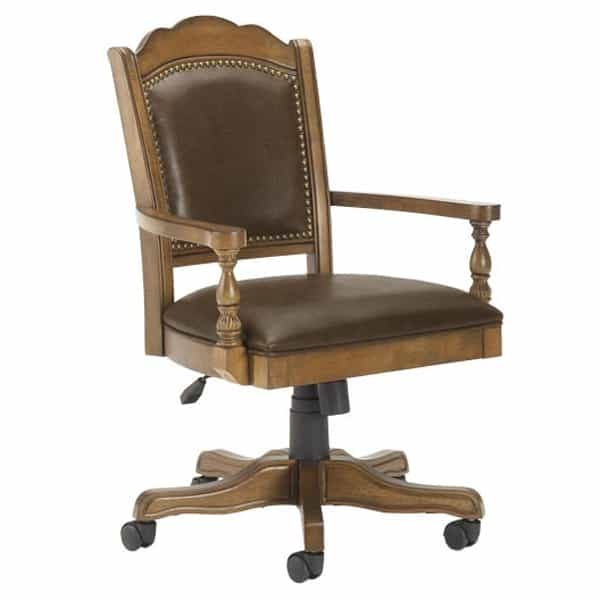 Mentioned previously, the chairs offer an Eastlake design with a traditional rectangular back, crown-like cresting, brass tacks or nail heads that outline the leather in the back rest and turnings similar to intricate versions of vase-and-block in the arm supports. This classic design masks the modern function of the chairs, which can swivel and adjust to different heights with an easy pull or push of a lever. 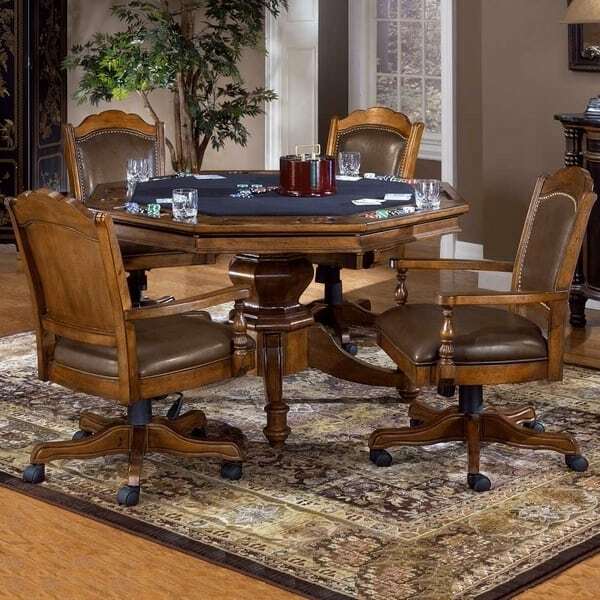 If you wish for flawless multiple functions and a stately style, the Nassau Game Table Set is for your game room. W 52" x D 52" x H 30"
W 22" x D 20" x H 49"
This item requires freight delivery. This shipping method uses a full-size semi-trailer truck and the product will be delivered to a street side location. Most delivery times within the Continental U.S. range from 5-7 days on in-stock merchandise; drop-ship items will ship from the third party warehouse within 72 hours of order placement. A representative will call to schedule your delivery which will require a signature upon receipt.